MEDRAD introduces the 9500 Vital Signs Patient Monitor, one of the only monitoring device in the MRI marketplace that uses fiber optics in both its electrocardiographic systems and pulse oximetry sensors to eliminate the risk of patient injury due to RF burn. 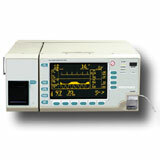 Designed specifically for the MR environment, the 9500 uses a unique module that converts the patient's ECG from electronic to fiberoptic signal form for reliable, efficient gating. Medrad Service engineers are located in all major metropolitan areas of North America, Europe, and Japan. Our factory-trained authorized dealers support all other areas of the globe. All service, upgrades and parts are backed by a 90-day Warranty. Additional programs extend repair Warranty to a full year and beyond.